As was true last year, there is a prediction of above normal temperatures for a wide swath of the county. However, I haven't seen these predictions holding up. The code "EC" stands for equal chance of above, below, or normal precipitation. Apparently, the climate prediction center isn't getting as clear data for this autumn. The same is true for the 3-month prediction. So for many of us we'll just have to wait and see. I always appreciate you posting these predictions. Interesting 3-month temperature outlook for most of the States. Interesting 3-month temperature outlook for most of the States. I sure don't understand this prediction at all. It seems to imply that there would be a an extremely strong ridge of high pressure centered over New Mexico that would dominate the nation's weather pattern. That does happen in the Summer, but would this be likely at the end of Autumn? The other thing that seems very suspicious is the failure to have these elevated temperatures effect the precipitation forecasts. If the temperature was truly that much warmer because of high pressure ridge located in the Southwestern deserts, the rainfall should be lower in places like Southern California. Yet, the precipitation forecast is equal chance right were the high pressure would be strongest. Sure doesn't make any sense to me. I personally have lost all faith in these long range forecasts of climate. I do keep an eye on the 6-10 and 8-14 day forecasts. They can be more reliable, but haven't been so trustworthy of late. The Northwestern part of the United States is predicted to be cooler while a large swath of the rest of the country is expected to be warmer. Once more, there is a prediction of above normal temperatures for a wide swath of the county. For those of us in the west still remembering recent droughts, this is good news. 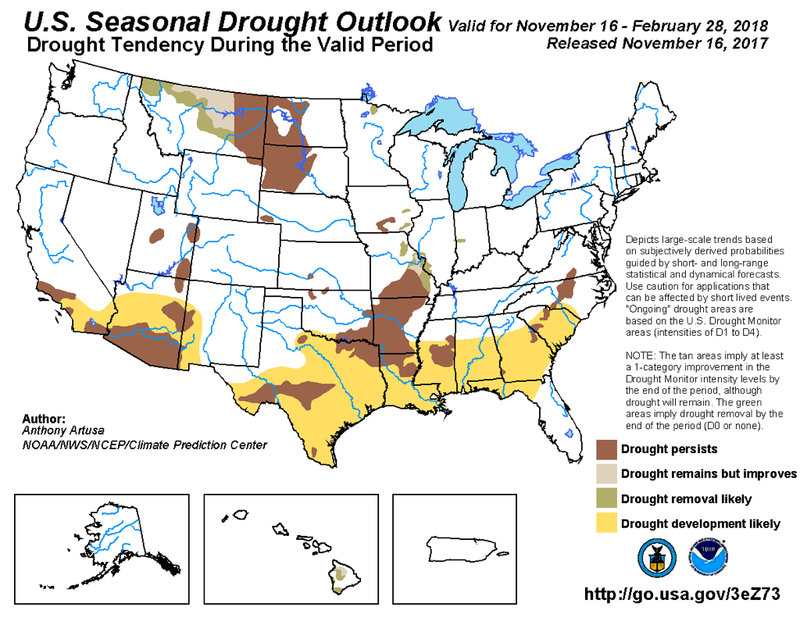 Alas for the South the drought is expected to continue. The code "EC" stands for equal chance of above, below, or normal precipitation. So once more there are large parts of the country where the data doesn't make any predication. However, some states in the West are expected to be above normal while once more the drought in the South is expected to persist. Thanks for posting. Not much to cheer about. The Eastern part of the United States is predicted to be cooler while a high pressure is expected to remain over Southern California and effect a large part of the West. The good news of November's forecast has been replaced with a very gloomy forecast of well below normal precipitation. At best, some parts of the country are uncertain. The rest can expect below normal precipitation. The Northern third of the country is expected to get above normal precipitation, while the Southern third would be deprived of moisture. It shows the drought in the South continuing to fester while parts of the West move toward drought. 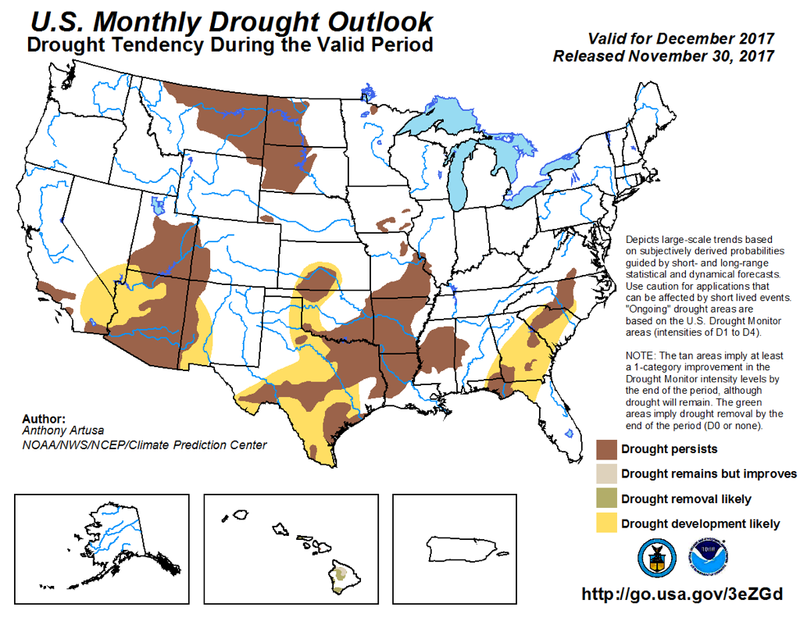 The 3 month outlook expands the trend with large areas of the South suffering from intensifying drought. Such are the forecasts we are facing . . . . It would sure be nice if you could post more positive forecasts for our part of the country. No kiddin' . . . . The local forecasts are perfectly consistent with the climate prediction center outlook and we find ourselves with what used to be an abnormal ridge of high pressure blocking storms all the way into Canada. It is expected to strengthen through the end of the week and remain in place through at least mid-December. The latest forecast discussion doesn't see any signs of this ridge being displaced as far as the models can forecast. Since December is the second wettest month of the year for most of the West, even if the rains return for the second half of December it is extremely unlikely that we'll get enough precipitation to compensate for what will most likely will be the loss of 1/2 of the available days in the month. The water supply is such that we can water as needed. However, that won't help the wild plants or animals. It looks like I'll have to restart the water regime already this week and that certainly isn't going to improve my mood. . . . . .
"Water as we want" won't, as you said, help the brown grass and drought burdened trees. And I hear there are strong winds/gusts that are causing red fire flags all around you State! Maybe having water to soak around your house might help some people. It looks like I'll have to restart the water regime already this week and that certainly isn't going to improve my mood. . . . . .
You've been in a less than exuberant mood for quite a while. At least as far back as the Buick engine requiring another crack at resurrection. Hang in there. Something positive is bound to happen. Maybe. We're having long periods of sunny days and freezing nights in our part of Northern California. We need to irrigate, but we had to drain the irrigation lines because of overnight temperatures in the 20's. Droughts are not just for hot summers, they are happening in cold winters too. I have set up my drip irrigation to facilitate draining them, but down here next to the Pacific the overnight lows have been trending warmer in recent years. You have my sympathies. Between problems like yours and the wildfires in Southern California the situation is looking bleak indeed. You've been in a less than exuberant mood for quite a while. At least as far back as the Buick engine requiring another crack at resurrection. Afraid so, the trends have been uniformly negative. Hang in there. Something positive is bound to happen. Maybe. I'm 100% certain that something positive will happen. Alas, a this point I can find only one mechanism that is trustworthy: the second coming! Considering how far down things have degraded, this will be unavoidably require a complete makeover of the entire cosmos. As scripture has made clear, not everybody will be either ready or pleased with the changes. As scripture has also made clear - it isn't like anybody will have a choice in the matter! Page created in 0.204 seconds with 21 queries.